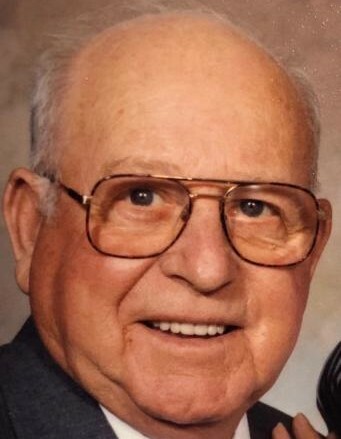 Orville Dennis Sr., age 91, of Hudson passed away on Monday, April 8, 2019 at Northern Lakes Nursing & Rehabilitation Center in Angola. He was born on December 5, 1927 in Morgan County, Kentucky to Carl and Lula (Elkins) Dennis. Orville married Annabell Lea Walker on July 26, 1947 in Hudson. She resides in Hudson. He worked for NIPSCO in Fort Wayne for 35 ½ years. He enjoyed hunting, fishing, mushroom hunting, playing cards and going to car races. His wife of 71 years; Annabell Lea Dennis of Hudson. Daughter and son-in-law; Debra Ann and David Barrone of Hudson. Son and daughter-in-law; Orville Dennis Jr. and his wife Jeanine. 5 grandchildren and their spouses; Brad and Melissa Dennis, Nick and Shelly McCoy, Eric and Mandy Dennis, Amy and Andy Offerle and Kelley Barrone. 8 great grandchildren; Layton, Luke, Jayde, Griffin, Kendall, Kadin, Reid and Hilary. He was preceded in death by his parents, a granddaughter; Nikki and a sister; Alene Pollos. Visitation will be held on Sunday, April 14, 2019 from 2:00 to 6:00 PM at the Feller and Clark Funeral Home, 875 South Wayne Street in Waterloo. A funeral service will be held on Monday, April 15, 2019 at 11:00 AM at the Feller and Clark Funeral Home in Waterloo. Officiating the funeral service will be Pastor Don Greulich. Burial will take place in Fairfield Cemetery in Corunna. Arrangements have been entrusted to Feller and Clark Funeral Home of Waterloo.